If you have a big filling that needs replacement, you may have been told you will simply have to get a complete crown. 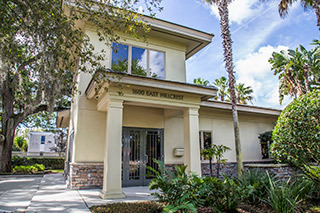 Orlando Cosmetic Dentist Dr. Puig prefers to use the least invasive, most conservative route whenever possible, and offers inlays and onlays along with other cosmetic dentistry treatments in Orlando. Not every situation is right for an inlay or onlay, but Dr. Puig will assess your problem and determine the best solution for you. When a simple filling isn't enough, we offer inlays and onlays to repair your bite. Schedule an appointment today! Because they are created in a lab like a crown, inlays and onlays require two appointments. At the first visit, we will prepare your tooth by removing your tooth decay or old filling and cleaning the area. We will take a dental impression and send it to our lab so that a technician can create a custom inlay or onlay for you. Dr. Puig will determine the best material to use, but in most cases, teeth that show when you smile or speak can have a white restoration. Back teeth undergo extreme pressure, so a gold or porcelain inlay or onlay may be indicated. You'll wear a temporary covering until the lab delivers your final restoration. At the second appointment, Dr. Puig will remove the covering and permanently cement your final inlay or onlay into position. After polishing and modifying the restoration as necessary to ensure proper bite alignment, you'll enjoy your stronger, healthier smile for years to come. Think an inlay or onlay might be what you need? Call our office or use this form to request a consultation with Dr. Puig.